Good progress this week, helped by a couple of days’ leave to put my feet up, knit and listen to Arnold Bax’s elusive symphony cycle conducted by the late Vernon Handley. I wonder if this is down to the fact that the pattern requires me to keep score of completed rows on a sheet of paper? 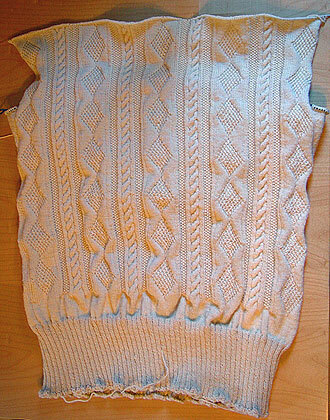 This way, I know exactly how many rows the back consisted of, and I can tick them off as I work my way up the front – which gives a curiously satisfying sense of progress. Rather like chasing a total in a one-day cricket match, you know exactly how many runs you need to win, and you just have to accumulate them. 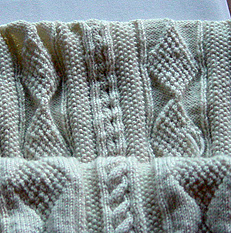 As I near the top the circular needles tend to get a bit floppy as they’re effectively unsupported, which makes the act of knitting a bit unwieldy – like trying to dress an ornery drunk in formal evening dress – and I’m acutely aware of some unevenness in the panels of moss stitch (the alternating P-K-P-K-P-K/K-P-K-P-K-P pattern), with occasional (but very noticeable) gaps appearing, like sunlight streaming through holes in the roof of an old barn. Once again, I’m relying on the final washing and blocking to even things out. Next Decision Point coming up: how deep to make the front neckline?